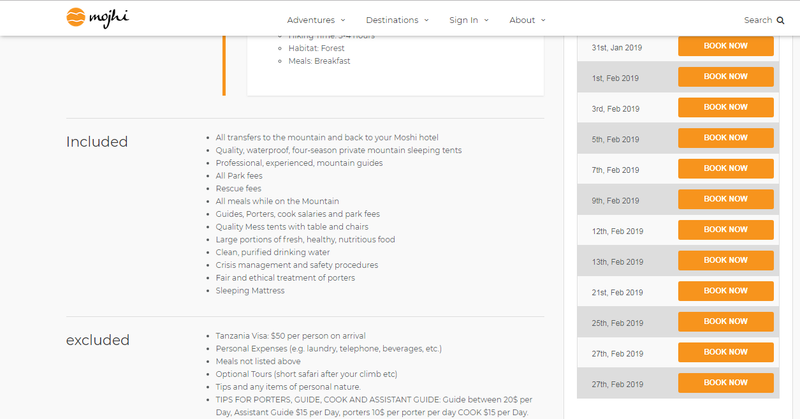 Mojhi, one of the leaders in the global adventure tourism industry, recently introduced the“Book Now” feature on its website to offer instant adventure booking options to all its customers. Now, customers can book their adventure tour with just a click. This new feature on Mojhi’s website is a part of the company’s initiative in delivering fast and simplified travel solutions to its customers. Going by the company’s mission of making adventure bookings as simple as possible, this feature is a true testimony to it. The Book Now feature unfurls a complete list of Upcoming Departures to adventures at Mojhi. The page also enlists all necessary details regarding the various adventure tour packages like the days covered, payable amount, reporting location, route, time of departure, time of arrival, hiking time, meals & refreshments, and accommodation. The customers can find all the details right there on the tab and accordingly pay for the well-suited tour package with a click on “Book Now.” Moreover, the customers are given the liberty to customize their package as per their unique preferences before making the final payment online. This is just like how it would have been if they interacted with an adventure consultant. Now, they will be saving a lot of time on understanding the package and deciding what suits them best. “Based on the preferences and past experiences, we realized that customers like everything on-demand and in a click,” said Mr.Viswanath Raju, the Co-founder& Head of Marketing, Mojhi. “We analyzed the users’ behavior on our website and discovered that 80% of our customers look for the read-made packageswith the flexibility of slight customization. With the help of other such insights, we redesigned our platform in a way that users can now skim through the precise information and details available and can pay for it through our secure payment gateway. The complete booking process is now fast and intuitive.” he added. Online payments for large amounts have remained a concern for many customers. To curb this problem and assure the customers about the confidentiality and increased security of their personal data, Mojhi has stepped up its security and encryption in the various payment gateways it uses. Mojhi’s Book Now feature is now available on its official website. Whether clients are looking for Kilimanjaro trek or safari in Tanzania, they can simply log on to the website and book their next adventure in the fraction of a minute. Since this feature has gone live on Mojhi’s website, customers are seen appreciating the ease of booking. This enables them to plan their tour evenon the last-minute because the packages are predefined. All they need to do is selecting the favorite package, checking details, and making the initial payment. On the other hand, this new service feature will help Mojhi foster good relationships with all its customers.